The second Tuesday each month is Savvy Tuesday in Berwick, and that means local businesses will have some extra special offers for local shoppers! Tomorrow we have some Winter Warmer specials for you. Bowel cancer claims the lives of over 80 Australians every week. As everyone heads into the long weekend, our team will be ready and waiting to help, even on the Queen’s Birthday holiday. 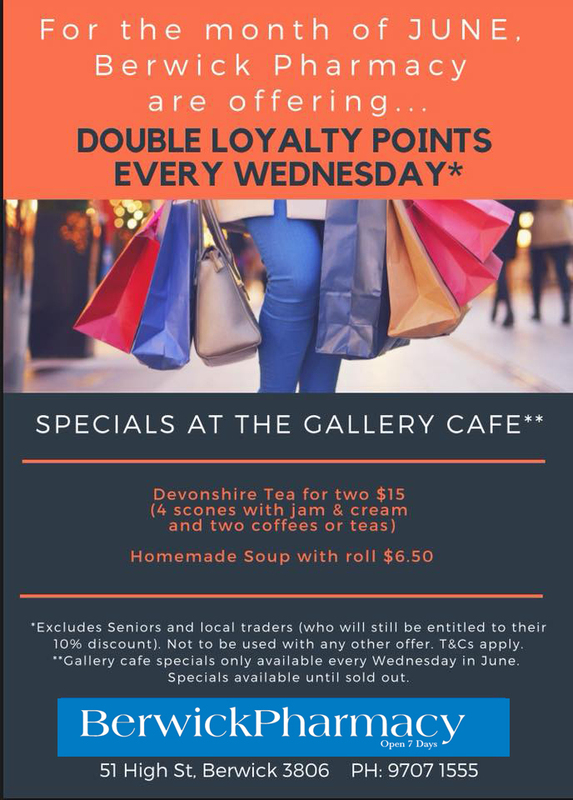 We are excited to be offering DOUBLE POINTS to our members every Wednesday in June. Simply present your loyalty card to the register, and enjoy your bonus points, yours to redeem as you wish. We also have some specials at our Gallery Cafe to keep you warm this winter! You may have seen our post last night about the new Chanel Bleu de Chanel Parfum, but let’s not forget the other new products from Chanel! Winter brings with it colds, flu and sniffles, which is no fun for anybody. Our team at Berwick Pharmacy is here to help you make it through. 💉 flu vaccines – we have stock of adult vaccines, which can be administered by our trained pharmacists. We are waiting on more supplies of children’s vaccines. 🤧 medicines to help relieve the symptoms of cold and flu, such as cough mixtures, decongestants for runny or blocked noses, and lozenges. 💊 vitamins to help support your immune system. 😷 vaporisers to help you breathe easier.